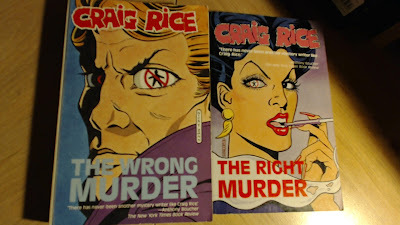 Pictured above are two novels by the great Craig Rice, an author whose work I have come to admire. 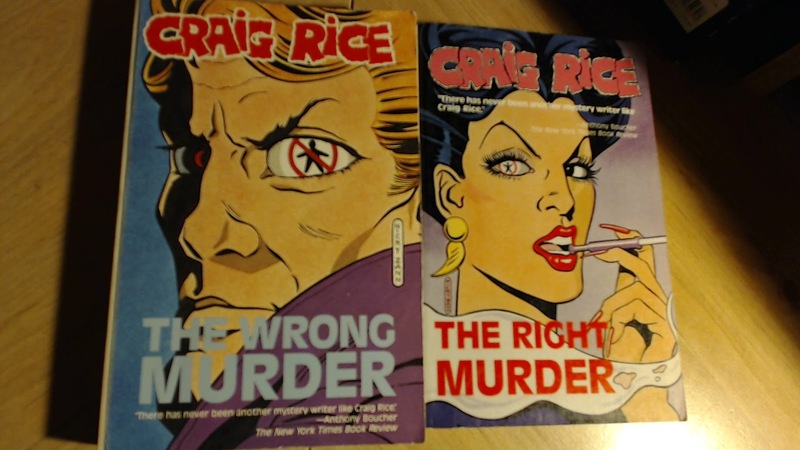 They are The Wrong Murder and The Right Murder… and it’s always a treat to add more Rice! Why? Because it gives me an excuse to go through the stuff I’ve already got! Next are two Crippen & Landru volumes, The Columbo Collection by William Link and Carpenter and Quincannon: Professional Detective Services. And now for a detour to France! I got two novels by author Stanislas-André Steeman (who will soon be getting his own page on this blog): L’Assassin habite au 21 (The Murderer Lives at No. 21) and Quai des Orfèvres (Quay of the Goldsmiths). 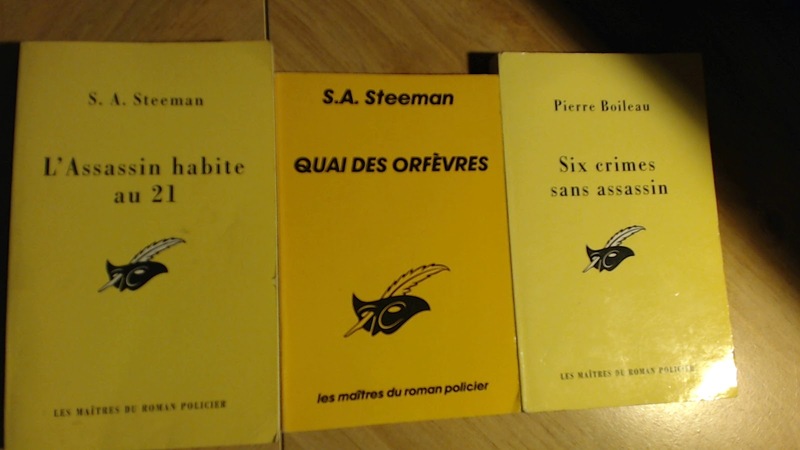 The third book is by Pierre Boileau, half of the Boileau-Narcejac writing team, and it is supposedly a classic in the locked room genre: Six crimes sans assassin (literally Six Crimes without a Murderer, though it was translated under a different title). And now we come to the last great expedition. All the books from this point on were purchased from Barry Ergang. You can find all his books for sale here. (The link is also in my sidebar.) Barry is a wonderful fellow and a very honest one. His book descriptions are bang-on accurate. If he says it’s in good condition, it’s in good condition. He ships items very quickly and he doesn’t inflate shipping costs. I paid for what I got and I couldn’t be happier. 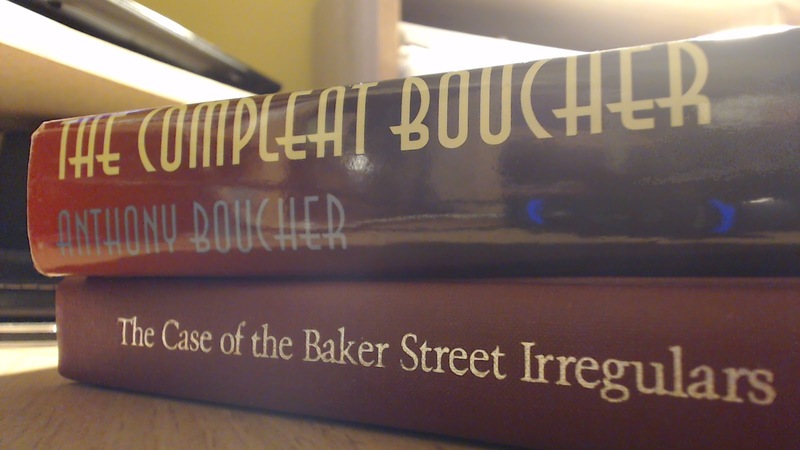 The packaging was also excellent; the books arrived in excellent condition and were suitably protected from any sort of damage. 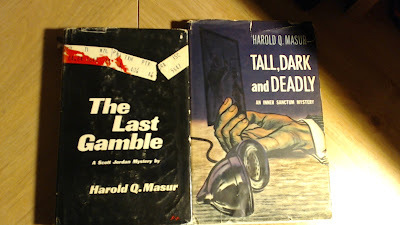 The books pictured above are by one Harold Q. Masur, who apparently married traditional plotting with a hardboiled style. I’ve yet to read one of his books but am highly intrigued. 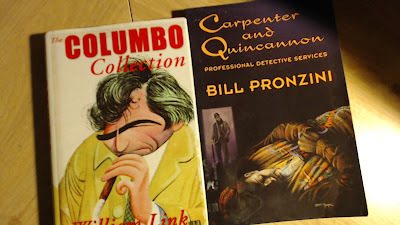 Patrick Quentin has appeared on the blog before, and these two books seem quite interesting. 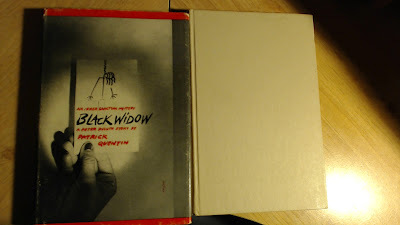 I was particularly interested in Black Widow because I have a DVD of the film adaptation that I wanted to watch… but I wanted to read the book first! The other book is The Case of the Green-Eyed Monster. The four books pictured above came highly recommended. Joe Gores’ Hammett, which was turned into a movie, was one I was especially interested in. I also loved the plot idea of Ross Thomas’ The Eight Dwarf. 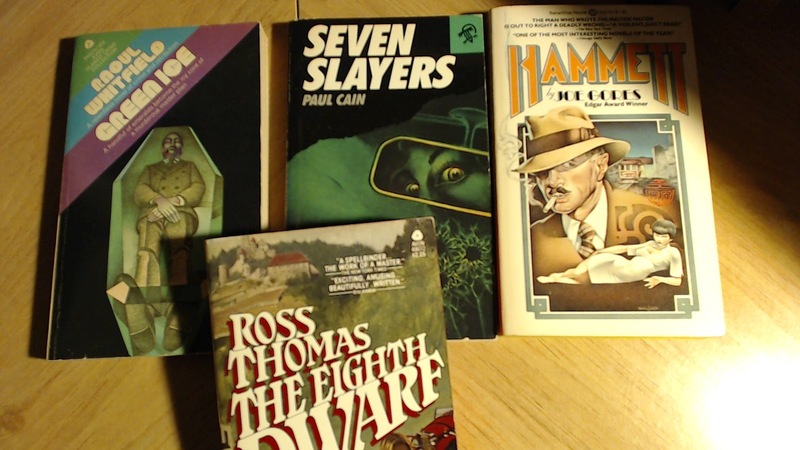 Raoul Whitfield’s Green Ice and Paul Cain’s Seven Slayers were praised in such glowing terms that I simply could not resist. Now let’s return to some traditional plotting. On the left we have a John Rhode novel, The Claverton Affair. 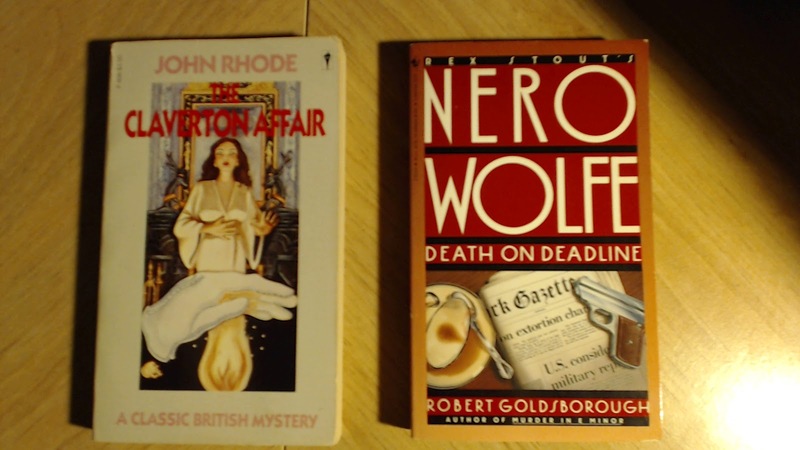 On the right we have Death on Deadline, a Nero Wolfe novel written by Robert Goldsborough. I have almost all the Wolfe books, including the Goldsboroughs, and this was one of the few gaps in that collection. Finally, Donald Hamilton’s The Ambushers is a book I decided to roll the dice on. I am unfamiliar with the author and the series character of Matt Helm, and it seemed as good a place as any to start! Any thoughts and recommendations are most welcome! Good stuff! I enjoy seeing what books other people are adding to their library. I've read the majority of Harold Masur's Scott Jordan mysteries and have enjoyed them (IIRC the character was inspired by Archie Goodwin). The type of book I think of as a "comfy" read. These look like great fun Patrick - one is very envious but also looking forward to reading the reviews! I don't think Paul Cain is for you, Patrick, but I will await your review of SEVEN SLAYERS. I'm often surprised by your reactions to some of the private eye and noir writers. Aside from Carroll John Daly he is the hardest, darkest and cruelest of the Black Mask writers. 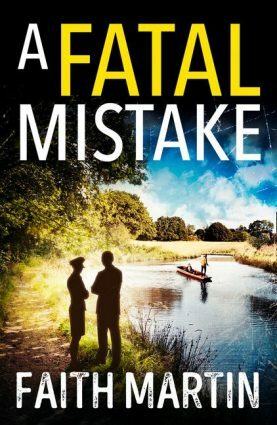 But he has a more stylistic touch than Daly's often crude pulpy writing. 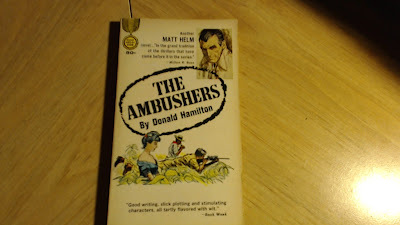 And don't expect the Dean Martin's Matt Helm when you read THE AMBUSHERS. Hamilton's professional assassin is a pretty tough guy. Violent, lots of bodies, torture scenes every now and then. I prefer Jonas Wilde to Matt Helm, though. The Boileau book is already pretty high up the list, BTW. It was translated, I believe, as THE PHANTOM STRIKES SIX TIMES. At the moment I am reading another French novel from the picture that I hope will be just as intriguing-- but that one has never been translated! It makes me want to take up my pen and try doing it myself! I'm glad to hear it-- Masur's stuff looked like plenty of fun, but it's nice to hear another addict say so. Congrats on your latest haul, Patrick!